In a few weeks, Julia Flores Colque will celebrate her 118th birthday. 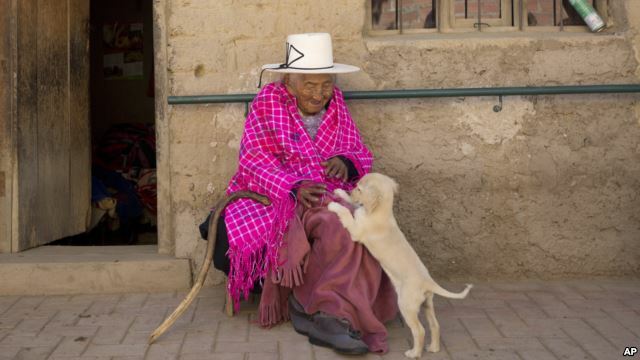 She is the oldest woman in Bolivia. Following the death of a woman in Japan earlier this year, Flores Colque may now be the oldest person in the world. During her long life, Flores Colque has seen two world wars. Her home country of Bolivia had a major revolution. And the town where she is from, Sacaba, has grown from 3,000 people to 175,000. But right now, Flores Colque seems mostly interested in her dogs, cats and rooster. She has not heard of the Guinness Book of World Records, and she does not care if experts confirm she is the oldest person alive. 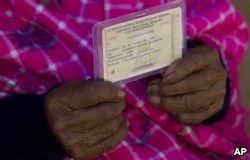 117-year-old Julia Flores Colque holds her identification card displaying her date of birth in Sacaba, Bolivia. “She’s always been active, easygoing and fun,” says her grandniece, who lives with her in a simple home with a dirt floor. Government officials have paid for some improvements to the house, adding a brick path and railings so Flores Colque can walk safely. The Sacaba mayor’s office calls Flores Colque part of the country’s living history. On the day a reporter from the Associated Press visited, Flores Colque was playing a small guitar called the charango and singing old songs in her native language of Quechua. “If you would have told me you were coming, I’d have remembered all the songs,” she joked. Then she dipped her finger into a cake and smiled while she licked the frosting. 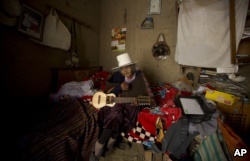 Julia Flores Colque holds a 'charango,' a small Andean stringed instrument, at her home in Sacaba, Bolivia. When she was growing up, Flores Colque herded sheep and llamas in the Bolivian highlands. Then she moved to a valley, where she sold fruits and vegetables. Those fruits and vegetables became her main food, and she still eats a healthy diet – except for a piece of cake and a glass of soda sometimes. She never married and does not have children. Today, the AP reporter says Flores Colque looks like a stone statue. She cannot hear very well, but she is alert and scolds her small dog when the animal goes into the road. Flores Colque’s age would make her interesting anywhere, but it is especially notable in Bolivia. The United Nations says the country has one of the South America’s highest levels of death. The Associated Press reported the story. 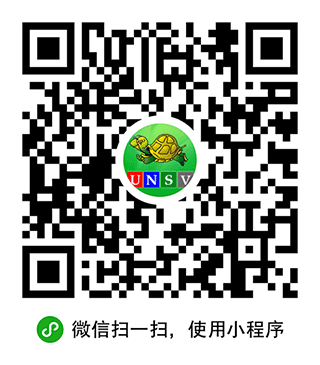 Kelly Jean Kelly adapted the story for VOA Learning English. Hai Do was the editor.